I’m a little late with my October round-up. Half term is over and it’s back to school and work, and life’s busy and hectic again *sigh*. 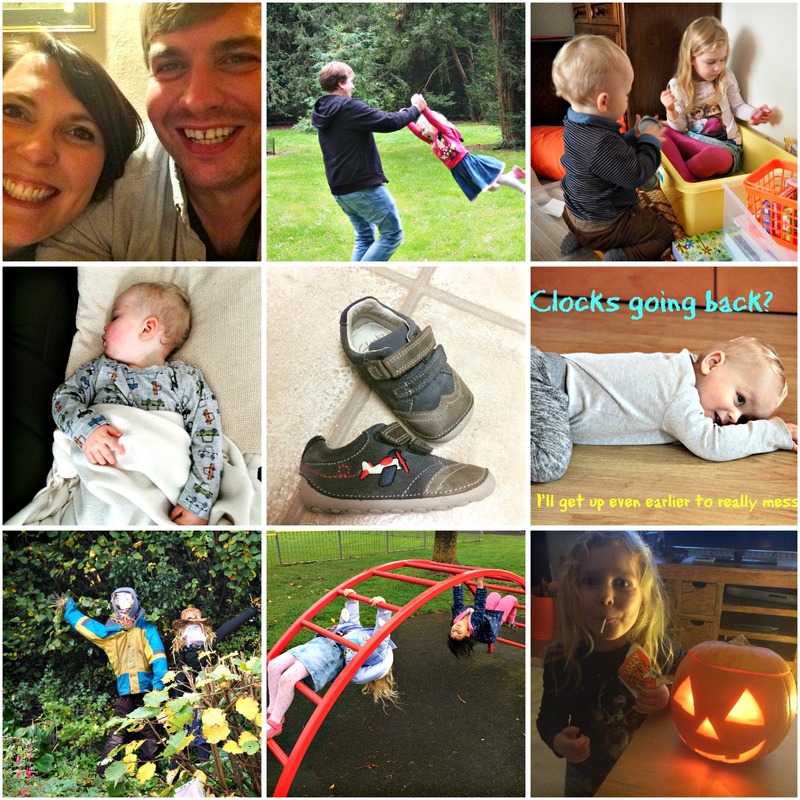 October has been good to us – we’ve had some lovely experiences, milestones and plenty of fun, and I’m so glad that I have the pictures to look back on. I know I say it a lot, but I can’t believe we’re heading straight for the end of the year – just 52 sleeps till Christmas, people! Ok, I won’t freak myself out any further, and go straight into my highlights of the month. 1. Date Night! John and I actually had a proper grown up outing, just by ourselves this month! It was the first time in nearly three years (!) and included a lovely Thai meal (both our favourite food) and hitting a few pubs afterwards. Long overdue! 2. Lots of lovely days out with the kids, making the most of the sunshine and the spectacular autumn colours. I love this picture of Becky being swung around by her Daddy, she couldn’t stop giggling and pretended not to be dizzy afterwards – hilarious! 3. A visit to Nanny & Granch’s house, where Alex and Becky continued to bond and beautifully played shopkeepers together (though Alex was more of a shoplifter than a good customer, mind). 4. Alex came down with a bad chest infection and spent last week on antibiotics. His cough was awful and the weekend before last he struggled to breath and scared the living daylights out of me, but he was still in good spirits and continued to clown around all the time. Bless him. 5. Buying Alex his first pair of shoes. They are so adorable and he looks even cuter in them! 6. The clocks going back, which I was not looking forward to. Luckily, both Alex and Becky managed to adjust to the time difference within a couple of days, which I’m so glad about. 7. Discovering the scarecrows on the scarecrow trail in our village as one of our half term activities – it was brilliant. 8. Lots of playground outings with Becky and her little friends – half term well spent! 9. And finally, Halloween celebrations on the last day of October. We had a spookily good time, and Becky thoroughly enjoyed dressing up as a witch and carving pumpkins.